Nettle belongs to the Urticaceae plant family. We use the dwarf or annual nettle, which grows all year in Egypt, North America and across Europe. It looks very similar to the common stinging nettle, but it is smaller with long stems and small, soft, green leaves. These are covered in tiny hairs and small flowers. First, a concrete is extracted from the Urtica urens plant, and it is further distilled using ethanol to create the absolute. All nettles contain vitamins A and C, minerals, and are very rich in chlorophyll. Nettle plants are commercially processed for the extraction of chlorophyll. Nettle leaves can be dried for teas and are also used to make nettle beer. 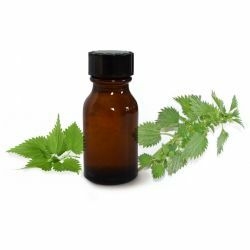 Nettle absolute has been used (by aromatherapists) on oily skin as an astringent, to balance dry skin conditions, and to help scalp and hair problems. It has also been used to treat burns, to relieve joint pain and for insect bites. We use nettle absolute and nettle infusion in our New shampoo bar to improve the condition of the scalp and hair.